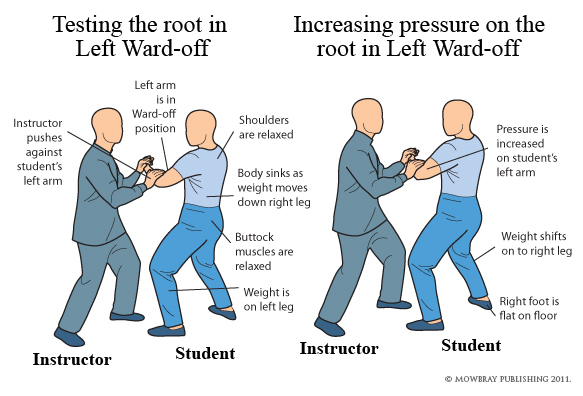 Once you have some experience with T’ai Chi basics and perform the Forms to a good standard, you may get introduced to ‘Push Hands’. Push Hands is a discipline where your objective is to upset your opponent’s rhythm and balance in a smooth and gentle way, but overcome him. To truly understand and feel the power of Chi and the techniques you’ve learned so far, it becomes necessary to train with another person and feel the energy flowing between you. This is done without any contact from kicks, punches or strikes of any kind. First you have to find a partner you trust and who’ll help you develop. It’s important you both realise you’re there to help each other progress and not get into a winner vs. loser attitude. You bow to one another before starting to show respect to your opponent. Once the exercise starts, you’re objective is to feel your opponents power and overcome him by first controlling their energy and then making them lose balance and stumble in some way. You do not use brute force, just skill. You should find yourself using circular motions with a calm and relaxed mind to find the weakness in your opponent’s technique and overcome him. You should feel your opponent’s power and channel it away from him and then use it to your advantage by turning it against him. Push Hands is used in tournaments and is a very popular way of demonstrating your skill and understanding of T’ai Chi.